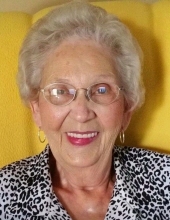 Rita Nowling, age 85 of Princeton, KY, formerly of Seymour IN, passed away Tuesday, March 26, 2019, at the home of her daughter. She was of the Catholic faith, a member of the Daughters of Isabella of the St. Ambrose Catholic Church in Seymour, IN, a retired store manager for a retail business and a homemaker. She is survived by her four daughters, Sheila Temple and husband, Paul of Portageville, MO, Pam Pruitt and husband, Ralph of Gideon, MO, Lisa O'Neill and husband, Patrick of Lyon County and Shannon Trafford and husband Dewayne of Princeton; one son, Mike Nowling, and wife, Mary of Seymour, IN; 17 grandchildren; 31 great-grandchildren, and 2 Great-great-grandchildren. She was preceded in death by her husband of 53 years Jack Nowling; her parents John Greenwell and Anna "Bun" Porter Greenwell; four sisters, Emma Louise Weller, Margaret Baker, Shirley Garvey, and JoAnn Donica Mace and one brother, John Gayle Greenwell and one great-grandson, Corbin Nowling. Visitation will be held Monday, April 8, 2019, from 9:00 AM to 11:00 AM at St. Ambrose Catholic Church in Seymour, IN. Funeral Mass will be Monday, April 8, 2019, at 11:00 AM at St. Ambrose Catholic Church, Seymour, IN., with Father Dan Staublin Officiating. Burial to follow in Riverview Cemetery, Seymour IN. Expressions of sympathy can be made to the St. Ambrose Catholic Church and School, 325 S Chestnut St, Seymour, IN 47274. To send flowers or a remembrance gift to the family of Rita M Nowling, please visit our Tribute Store. "Email Address" would like to share the life celebration of Rita M Nowling. Click on the "link" to go to share a favorite memory or leave a condolence message for the family.